Our most affordable industrial labelling solution. 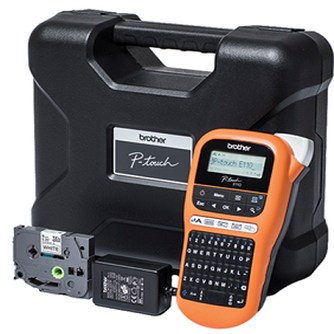 Label like a pro with the Brother PT-E110VP Handheld Label Printer, helping you get the job done quickly and correctly. This easy-to-use machine is especially fast and efficient, printing up to 12mm wide labels that are designed for durability, while the built-in cutter keeps hands free and the LCD graphical screen offers clear visibility. The PT-E110VP also has 200 built-in symbols including various electrician/installer specific designs, and comes with its own carry case. And with multiple cable modes including cable flags, cable wrap and face plate, the PT-E110VP has faster, better, safer labelling covered.d.